Toshiba Corporation today announced that its innovative SCiB rechargeable battery has been selected by Honda Motor Co., Ltd. to power its new electric car, the Fit EV. Toshiba will supply battery modules for the new car, which Honda will launch in summer 2012 in Japan and the U.S.A. The SCiB module for the FIT EV was developed with Honda. The module was supplied to Honda in December 2010 for evaluation in real-world verification testing of next-generation personal mobility products that the company conducted with Saitama and Kumamoto prefectures. Honda selected the SCiB module for the FIT EV after a comprehensive evaluation program that tested the battery's performance under diverse and demanding conditions. The SCiB has features that make it highly suited for automotive applications. Lithium titanate oxide in the battery anode achieves rapid charge times and a long battery life, and the SCiB is also capable of rapid charge and stable power discharge in a wide range of environments. In extremely cold conditions as low as minus 30oC the SCiB is less likely to experience lithium metal deposition, which enhances the risk of internal short circuiting and battery degradation, and at high temperature, even above 40oC, the impact on battery degradation is lower than in conventional lithium-ion batteries. The characteristics of the SCiB battery cell allow electric vehicles to achieve longer driving distances. The SCiB is able to use a wider range its charge than a conventional lithium-ion battery, and the SCiB also achieves highly efficient regenerative charging (using kinetic energy from braking and slowing down to charge the battery) that adds to performance. The SCiB charges in about half the time of a typical Li-ion battery. An SCiB 20Ah cell charged with an 80Ah current will reach 80% of capacity in 15 minutes and 95% in only an additional 3 minutes. The SCiB generates little heat even during this fast recharging, eliminating the need for power to cool the battery module. 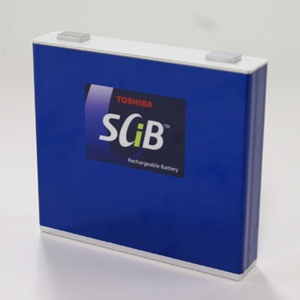 Moreover, the full charge-discharge cycle for SCiB is 4,000 times, over 2.5 times that of other Li-ion batteries. This long life is realizing the potential for reuse of the battery. Toshiba will take full advantage of Honda's selection of the SCiB to promote its further application in electric vehicles. The company will also promote use of the battery in other areas, including as a stationary power storage device in smart grids.